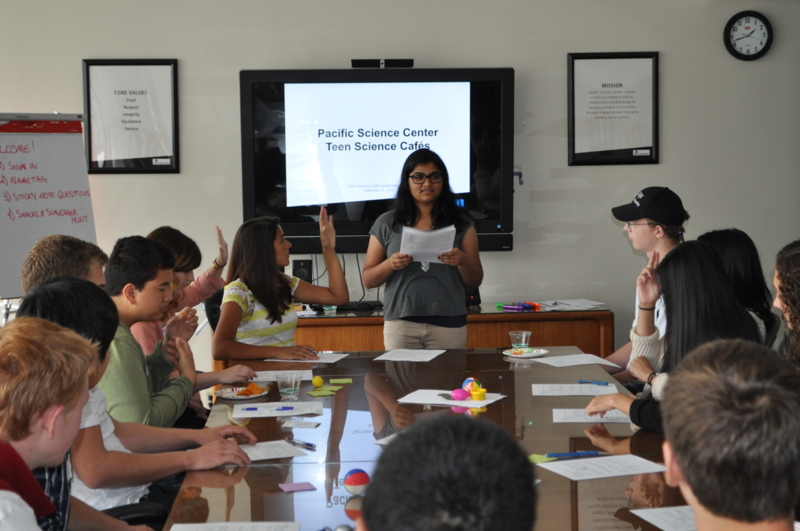 This is the second in a series of posts about the structure of the Teen Science Café at the Pacific Science Center. The author: DeLancey Lane is the Teen Science Cafe Intern at PSC. Last year PSC opened applications for a Teen Science Café Leadership Team and from those applications started a team with 22 Teen Leaders. Some were in high school, some home schooled, and one was even an 8th grader. From the beginning the youth were told it was their program, so their decisions were taken seriously. The adult staff (Portal to the Public Manager and Coordinator) guided the teens, explaining how normal Science Cafés run, options for organization of the leadership team, and more. The staff offered ideas; they did not tell them what to do. All of the decisions were that of the teens; they chose the way they wanted the team to be organized, the event organization, everything. After each event and at the end of the year they would reflect on what they think went well, and also importantly, what they didn’t like and wanted to change. Their decisions were never harshly questioned, nor were they scolded when things went badly; they simply adapted. The teen leaders were also given free range when it came to the events. They not only chose basic things such as scientist topics and food options, but they were the ones developing the marketing materials and activities we used at the events. All of the content on the fliers, which is normally written by adult staff, was instead written by the teen volunteers and edited by them as well. The Content committee would put their heads together to come up with an interactive icebreaker activity each time, which always got the crowd going. Previous: Training Presenters with POP!